When we first started Quantum Martial Arts, we really wanted our students to “build a better you”. You do this by setting goals and applying yourself in everything you do, including martial arts. If you work hard and never give up, you can reach your Black Belt, which is a symbol of excellence. The Black Belt is not an impossible task, but it cannot be achieved without determination, dedication and resilience. Suffering injuries mid-grading, but still willing themselves to continue. A Black Belt is simply a White Belt who never gave up. In the lead up to grading, you must put in countless hours of practice, work hard, remain focused, have discipline, be determined and resilient. In the middle of grading, even when things may not be going your way, you must remember and apply the countless hours of practice, the “working hard”, remaining focused, remaining disciplined, being determined and resilient. Whether you are in class or in the middle of your Black Belt grading, they are the same principles of success. You must be willing to put yourself in the line of fire to achieve excellence. Another factor to achieve Black Belt excellence is the support of the student’s family and the whole martial arts community, particularly the Black Belts who have gone beforehand. 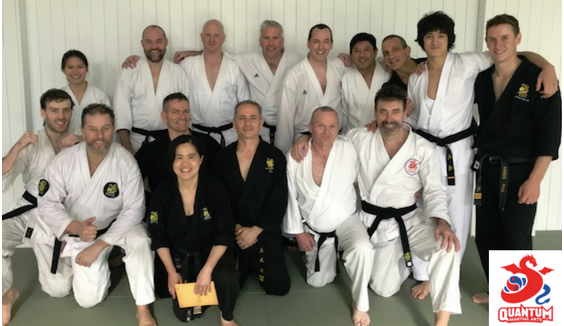 Black Belts know how tough the whole grading experience is. That is why they work you hard, while secretly willing you to succeed. It is why they openly welcome you when you join the Black Belt family. Once you are part of the Black Belt family, you are there for life. However, to make the most of your Black Belt experience, you must provide service back to the students who aspire to be you. There is an old Samurai saying that goes, “it is better to give than to receive”. Every Black Belt knows this to be true, which is why they so generously offer their service to everybody. I must admit, I get a little emotional following Black Belt gradings. I know how much effort each student has put into their training. I know the weaknesses the students need to overcome. To then see the students go out and perform in their grading is really inspiring, yet tear-jerking, to me. I really want the students to enjoy the moment, as they have achieved something wonderful. The students have learned lessons that will stand them and their families in good stead for the rest of their life. However, for those who have just got their Black Belts, beware! My emotional feelings only last until the next training session. Remember, the secret to success is countless hours of practice, work hard, remain focused, have discipline, be determined and resilient. You have reached a pinnacle of excellence that must be maintained. You are now an example to all of the other students. So back to work….you are a Black Belt now!!!!! If you like this article, please share it with others via your preferred social medial channels. If you would like to share your experiences, please feel free to leave comments below.